Clubs and planes have a lot in common -- they're hassles to get into, they're both expensive, and everyone in them will soon be super high. Welcome to a plane that's actually from the hottest club around: StndAIR. 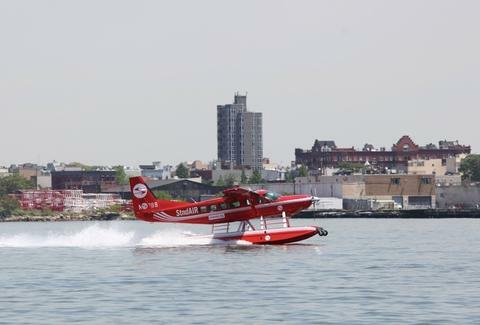 The team behind the Top of the Standard (aka the Boom Boom Room) has decided to help everyone escape to the Hamptons this summer via their East River-docked "family seaplane", though most families have to settle for just seeing planes. Fitting up to eight people in its multi-windowed cabin, the sleek, red w/ white stripes Cessna reaches its destination in just 45min by doing 180mph at around 20000ft, all accomplished on a 675HP engine and a front propeller rocking just three blades, which, just like the movies on a TNT marathon, become an indistinguishable blur. The primary offerings are daily flights to the East Hampton Airport, with off-peak seats starting as low as $30 and incrementally increasing in price until the whole flight's full, a process they call "Flight Board", though you'd have to have serious ADD to become so yourself considering they only last 45min. If the Hamptons are too played, you can charter the plane to take you to any number of other destinations, including Martha's Vineyard, Nantucket, and Shelter Island, which no longer have to share with clubs the fact that you need to be ferried home.